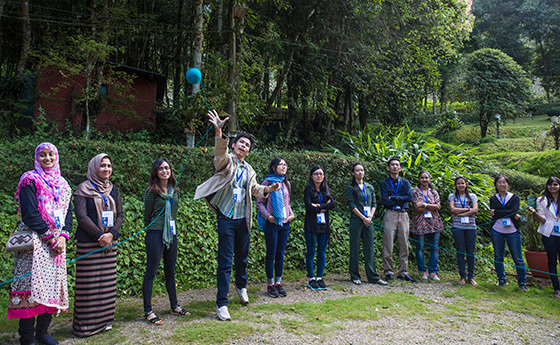 The International Centre for Integrated Mountain Development (ICIMOD) engages young professionals and builds their capacity to bring about positive changes in society through several initiatives. Building on the success of these initiatives, ICIMOD is now preparing for the Asia Pacific Youth Forum 2016 (#APYF2016), which will take place in Kathmandu, Nepal 27-30 September 2016. The event will bring together young professionals, including scientists, early career professionals, young politicians, and youth initiative leaders from the region, and will develop their knowledge on mountains and climate change issues with a focus on the role of youth in the implementation of the Sustainable Development Goals (SDGs). Participants of the Asia Pacific Youth Forum 2015 at the ICIMOD Knowledge Park, Nepal. As active agents of change in local communities, young people have an effective role in engaging people on a grassroots level, and are instrumental in communicating SDGs to the wider public. The APYF2016 aims to foster networking among young researchers for better collaboration, integration, and innovation in sustainable mountain development in realising the SDGs. With technical support from several leading institutions, the four-day programme will include capacity building and knowledge exchange sessions, leadership exercises, and excursions to nearby environmental projects. This forum is made possible with support from the Swiss Agency for Development Cooperation (SDC) under its Sustainable Mountain Development for Global Collaboration (SMD4GC) programme, and the International Centre for Integrated Mountain Development (ICIMOD).